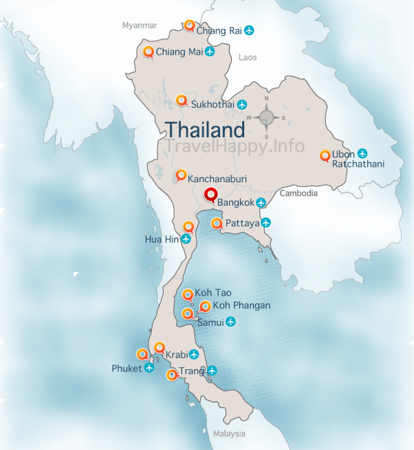 Phuket is Thailand’s largest, most popular island. Our Phuket guide covers beautiful undiscovered beaches, dining, hotels and lots of things to see and do. Thanks to its international airport and regular bus services to and from Bangkok, Phuket has grown into Thailand’s most popular island. From shopping malls to world-class beaches and vibrant nightlife, this large island offers an excellent combination of civilisation and natural beauty. Most of Phuket’s areas of interest are on the west side of the island, where you’ll find Patong, Karon, Kata and other popular beaches. Phuket Town, the island’s provincial capital, is where you’ll find most of Phuket’s shopping and commercial activity. Although Phuket is far from undiscovered, the sheer variety of things to do and places to stay make it one of Thailand’s best islands to visit. Located in the southeast of Phuket, Phuket Town is the island’s main commercial centre and provincial capital. Although there’s not much in Phuket Town that’s of interest to tourists, this is where you’ll find Phuket’s main shopping malls and administrative buildings. 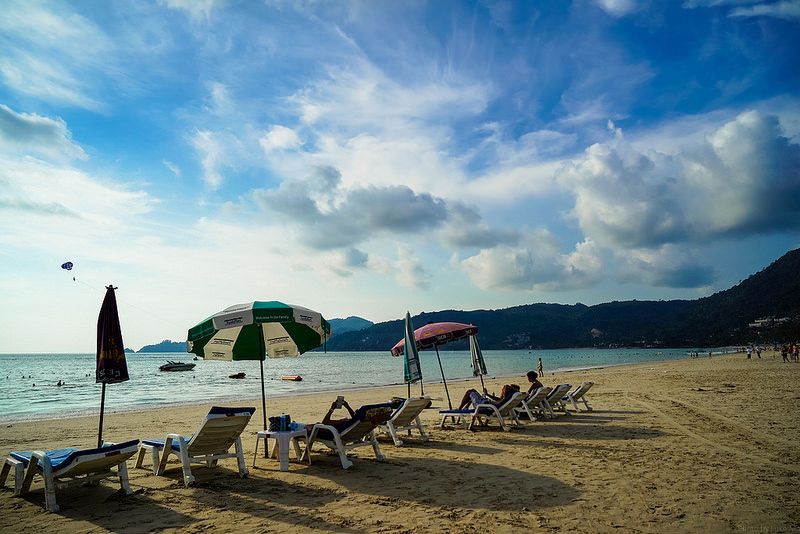 Patong Beach is Phuket’s most popular beach area — a mix of natural beauty and large-scale commercial development. Patong Beach itself is beautiful but crowded, while the Patong area is home to most of Phuket’s popular bars and nightclubs. A short drive inland from Patong Beach is Kathu — a quiet and relaxing community that’s one of Phuket’s most popular expat areas. You’ll find a few of Phuket’s most popular golf courses around here, as well as a range of outdoor tourist attractions. Kamala Beach is an upmarket beach resort area located to the north of Patong. Although it’s close to Patong, it couldn’t be more different — while Patong is crowded and noisy, Kamala tends to attract families and retirees seeking peace and quiet. Surin Beach is a luxurious beach community to the north of Kamala. Popular with expats and wealthy Thai celebrities, Surin is home to several of Phuket’s most luxurious hotels and beach clubs. Located south of Patong Beach, Karon Beach is a mix of Patong’s hustle and bustle and the quieter family atmosphere of Kamala Beach. Alongside the long and uncrowded beach, you’ll find a great selection of restaurants and bars here. Kata Beach is located south of Karon and attracts a mix of families and solo travellers. Kata offers some of the clearest water of any of Phuket’s major beaches, reasonable waves for surfing and bodyboarding and a good selection of beachside restaurants. 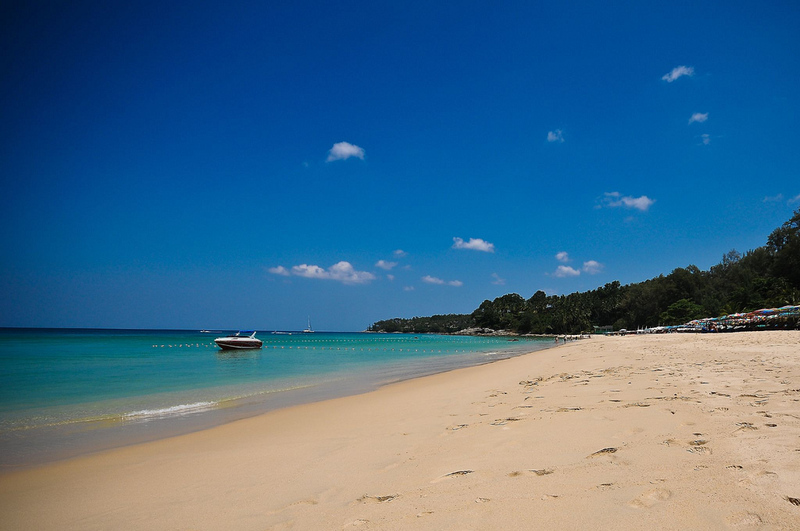 More popular with locals and expats than tourists, Nai Harn Beach is a quiet beach located on the south coast of Phuket. 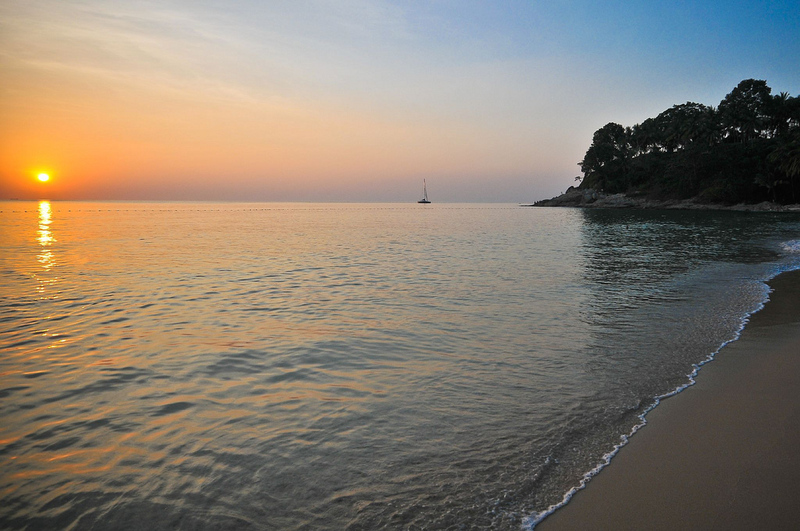 During the rainy season, the rough seas around Phuket make Nai Harn one of the best beaches on the island for surfers. A quiet and peaceful beach village on Phuket’s southern coast, Rawai is a popular area with locals and expats. Although Rawai’s beach is far from spectacular, the area remains popular due to its relaxing feel and selection of great international restaurants. Chalong Bay is where you’ll find most of Phuket’s boats moored. Although the beaches near here are unremarkable and the water far from clear, Chalong’s deep harbour means it’s likely where you’ll depart from Phuket for inter-island transport or diving trips. Use the search box below to find out departure times and prices on your selected travel dates to Phuket. From surf beaches to relaxing expanses of sand ideal for families, Phuket is home to some of the best beaches in Thailand. Kata and Karon offer a great mix between civilization and quiet relaxation, while Nai Harn is Phuket’s best beach for surfers. Although Phuket’s waves are nothing to write home about, the west and south coast beaches are good surfing spots for beginners and intermediate-level surfers during low season. Surf boards and bodyboards are available for rent from Kata Beach during the rainy season. The numerous small islands and reefs dotted around Phuket are great places to snorkel and experience the Andaman Sea’s diverse underwater life. Many tour operators offer snorkelling tours of Phuket and its nearby islands. Phuket is a short distance from some of Thailand’s top diving destinations, making it a great place for divers to holiday. Popular diving locations close to Phuket include the King Cruiser wreck, the Similan Islands and Koh Dok Mai. Phuket’s numerous hills are great for enjoying the view. Good places to stop and appreciate the island’s natural beauty include the Kata-Karon Viewpoint, Phromthep Cape and Radar Hill Viewpoint near Patong. Phang Nga Bay — a stunningly beautiful bay full of gigantic limestone karsts — is one of the most impressive natural attractions close to Phuket. Book a day trip and explore Phang Nga by kayak or practice your Roger Moore impression on the beaches of James Bond Island. Located on a large hill between Chalong and Kata Beach, Phuket’s 45 metre Big Buddha is a great place to appreciate views of the island’s western coastline. The Big Buddha is easy to access by road, making it a great place to get a feel for the island. Located in Kathu, a short distance from Patong Beach, Phuket Wake Park is a large cable ski park that’s great for enjoying the heat. Boards and skis are available for rent on-site. A small swimming pool offers guests a chance to relax in between runs on the wake course. Kata Beach might be a fun place to surf during low season, but its waves are nothing to brag about from November until March. Surf House Phuket has the island’s only Flowrider — a surf wave located close to the beach that’s perfect for practicing your surf skills. Located on the beautiful Panwa Cape, Sri Panwa Phuket Villas offers a selection of luxurious private villas. The private villas range from one-bedroom suites ideal for couples to spacious family villas with private infinity pools. The Shore at Katathani Resort is a stunning five-star resort on Kata Noi Beach — a smaller, quieter beach close to Kata Beach. All of the hotel’s luxurious private villas include private swimming pools and excellent views of the Andaman Sea. Located in the north of Phuket on one of the island’s most secluded beaches, Renaissance Phuket Resort and Spa offers a selection of stunning suites and villas. Great on-site dining and one of the island’s most luxurious spas make this a great place to relax and escape. Located just minutes from Phuket’s quiet and largely undeveloped Mai Khao Beach, Anantara Phuket Villas is a luxurious and peaceful getaway. All of the resort’s luxurious villas have their own private swimming pools. Located on a small hill overlooking Kata Beach, Sugar Palm Grand Hillside Hotel offers great views of the beach and modern four-star rooms. Many of the rooms feature jacuzzis and pool access with views over Kata. On The Hill Karon Resort is a comfortable three-star hotel at the north end of Karon offering great views of the beach. An outdoor swimming pool, small fitness centre and great location make this resort a good choice for families and solo travellers. Sugar Marina Resort-Surf-Kata Beach is a modern 3½ star hotel located a short walk from Kata Beach. The resort’s sunny outdoor swimming pool is a great place to relax in between trips to the beach. Kata Beach Homestay and Backpacker is a clean and simple backpacker’s hotel that’s a short walk from Kata Beach. Accommodation ranges from beds in shared dormitories to double and twin private rooms. Located close to Jungceylon Mall in Patong, Tree Hug Home is a conveniently located, clean and simple two-star hotel. Double and twin rooms are available at reasonable prices, making Tree Hug Home a good choice for budget travellers that want to go out in Patong. The Green House Phuket offers spacious, comfortable and tastefully decorated rooms with a great location close to Karon Beach. Although the hotel itself has minimal facilities, its location close to Karon Beach makes it a great choice for budget travellers seeking sun and fun. The Boathouse Wine and Grill offers fantastic beachfront dining on Kata Beach. While indoor tables are available, arrive before sunset head for the terrace to enjoy fantastic views of Kata Beach as the sun goes down. Kata Cuit serves a selection of well-known Thai dishes, strong drinks and fresh coffee. With a location close to Kata Beach, it’s a convenient choice for people staying in Kata and Karon. 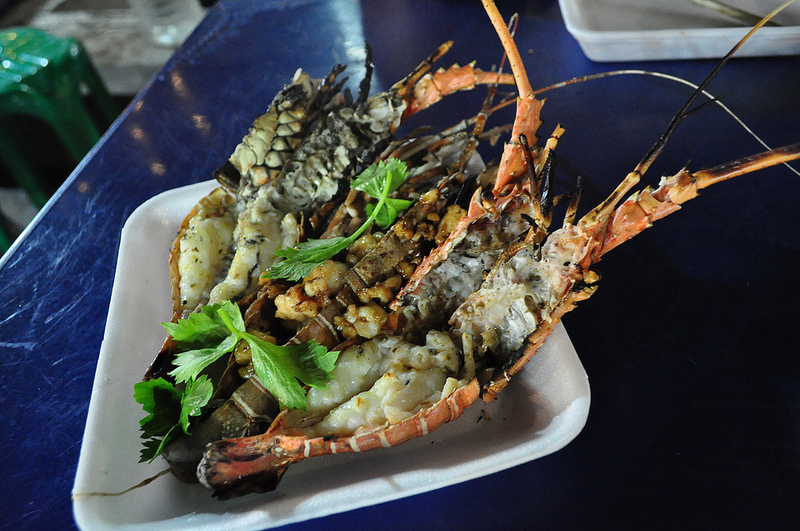 Phuket is famous for its seafood, and Tisara is one of the best restaurants on the island to eat fresh shrimp, lobster and other catches. The restaurant is located inside Trisara Resort. Siam Supper Club is a steakhouse located near the entrance to Laguna Phuket. Great steaks, seafood dishes and cocktails make it a good choice for a romantic night out. Located close to upmarket Surin Beach, Taste Surin Beach serves great burgers, salads and a selection of other contemporary dishes. A great choice if you’re in need of a break from Thai food. Located close to Kata Beach, Mom Tri’s Kitchen at Villa Royale offers a selection of excellent Thai and international dishes with one of the best ocean views in Phuket. Located close to Patong, Poo Nurntong Restaurant serves a range of Southern Thai dishes and classic Thai meals. Prices are reasonable and the restaurant’s quiet location makes it a good break from the noise of Patong. Blue Horizon serves tasty, inexpensive Thai food from its location close to Patong Tower. An excellent choice if you’re staying near Patong Beach and feel like an affordable Thai meal. Red Chair Plus offers a great range of Thai and international dishes. Located a short distance from Kata Beach, this restaurant attracts a good mix of locals, expats and travellers. Phuket International Airport is Thailand’s second-busiest international airport, with domestic and international flights arriving on a frequent basis. Flights to Phuket depart from Bangkok, Chiang Mai, Pattaya U-Tapao and Koh Samui on a daily basis. Check Skyscanner to compare airlines for the best prices and flight times to Phuket. A huge range of international airlines also offer direct flights to Phuket, making the island one of Thailand’s easiest beach destinations to access. 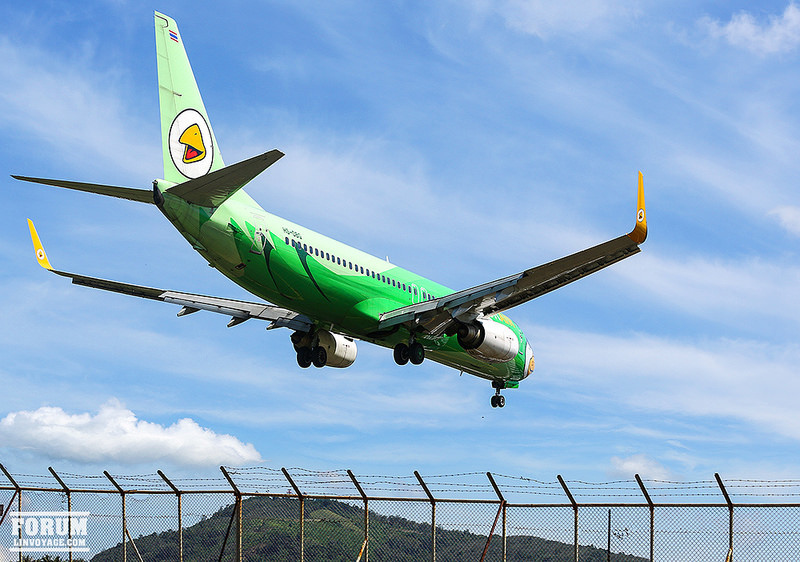 Phuket International Airport is approximately 45 minutes from most of Phuket’s beaches by road. Taxis and shuttle buses are available from Phuket International Airport, connecting the airport with the rest of the island. Public and private buses depart from Bangkok for Phuket several times daily. The journey to Phuket takes between 12 and 14 hours, with tickets priced from 650 baht for the least costly public bus service.